Last week I undertook what is becoming a near-annual pilgrimage to the cliffs at Bempton to visit the seabird colony there. This year the wind was blowing stiffly off the land and pushing most of the smaller birds far out to sea - so we saw a mere handful of razorbills, guillemots and puffins. 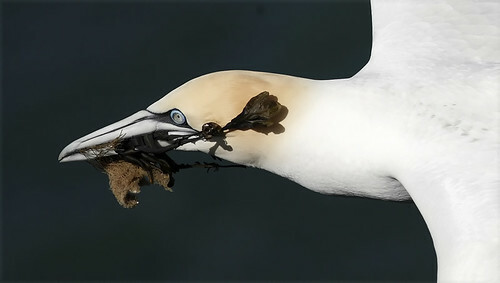 But the Gannets were out in force and the light was perfect. The following is a close crop from one of my favourite shots of the day. I was rather pleased with this one. I can't believe that it is nearly April and I have only posted three entries this year so far! Life is good, but busy for various reasons, and leaving little time to get out with my camera. To make matters worse my local park had a pollution event last year which has killed all the fish in the river and driven away a lot of the wildlife. No kingfishers this year I fear. 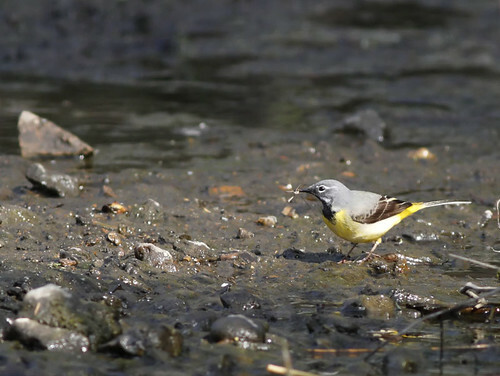 But things are looking up and spring has brought return visitors, including a welcome return for the grey wagtails. Low water levels are encouraging them to feed further upstream than normal giving me a great vantage from which to watch them. Hopefully will get some better shots than this soon - but here is one to keep me going.